Tags: Nanotechnology ( 367 ), Niels Bohr Institute ( 15 ), Quantum Computing ( 121 ), Quantum information can be stored and exchanged using electron spin states., Quantum Physics ( 46 ), Size matters in quantum information exchange even on the nanometer scale, The collaboration between researchers with diverse expertise was key to success., Two correlated electron pairs were coherently superposed and entangled over five quantum dots constituting a new world record within the community. At the Niels Bohr Institute, University of Copenhagen, researchers have realized the swap of electron spins between distant quantum dots. The discovery brings us a step closer to future applications of quantum information, as the tiny dots have to leave enough room on the microchip for delicate control electrodes. The distance between the dots has now become big enough for integration with traditional microelectronics and perhaps, a future quantum computer. The result is achieved via a multinational collaboration with Purdue University and the University of Sydney, Australia, now published in Nature Communications. Size matters in quantum information exchange even on the nanometer scale. Quantum information can be stored and exchanged using electron spin states. The electrons’ charge can be manipulated by gate-voltage pulses, which also controls their spin. It was believed that this method can only be practical if quantum dots touch each other; if squeezed too close together the spins will react too violently, if placed too far apart the spins will interact far too slowly. This creates a dilemma, because if a quantum computer is ever going to see the light of day, we need both, fast spin exchange and enough room around quantum dots to accommodate the pulsed gate electrodes. Normally, the left and right dots in the linear array of quantum dots (Illustration 1) are too far apart to exchange quantum information with each other. Frederico Martins, postdoc at UNSW, Sydney, Australia, explains: “We encode quantum information in the electrons’ spin states, which have the desirable property that they don’t interact much with the noisy environment, making them useful as robust and long-lived quantum memories. But when you want to actively process quantum information, the lack of interaction is counterproductive – because now you want the spins to interact!” What to do? You can’t have both long lived information and information exchange – or so it seems. “We discovered that by placing a large, elongated quantum dot between the left dots and right dots, it can mediate a coherent swap of spin states, within a billionth of a second, without ever moving electrons out of their dots. In other words, we now have both fast interaction and the necessary space for the pulsed gate electrodes ”, says Ferdinand Kuemmeth, associate professor at the Niels Bohr Institute. Researchers at the Niels Bohr Institute cooled a chip containing a large array of spin qubits below -273 Celsius. To manipulate individual electrons within the quantum-dot array, they applied fast voltage pulses to metallic gate electrodes located on the surface of the gallium-arsenide crystal (see scanning electron micrograph). Because each electron also carries a quantum spin, this allows quantum information processing based on the array’s spin states (the arrows on the graphic illustration). During the mediated spin exchange, which only took a billionth of a second, two correlated electron pairs were coherently superposed and entangled over five quantum dots, constituting a new world record within the community. Collaborations are an absolute necessity, both internally and externally. The collaboration between researchers with diverse expertise was key to success. Internal collaborations constantly advance the reliability of nanofabrication processes and the sophistication of low-temperature techniques. In fact, at the Center for Quantum Devices, major contenders for the implementation of solid-state quantum computers are currently intensely studied, namely semiconducting spin qubits, superconducting gatemon qubits, and topological Majorana qubits. All of them are voltage-controlled qubits, allowing researchers to share tricks and solve technical challenges together. But Kuemmeth is quick to add that “all of this would be futile if we didn’t have access to extremely clean semiconducting crystals in the first place”. Michael Manfra, Professor of Materials Engineering, agrees: “Purdue has put a lot of work into understanding the mechanisms that lead to quiet and stable quantum dots. It is fantastic to see this work yield benefits for Copenhagen’s novel qubits”. The theoretical framework of the discovery is provided by the University of Sydney, Australia. Stephen Bartlett, a professor of quantum physics at the University of Sydney, said: “What I find exciting about this result as a theorist, is that it frees us from the constraining geometry of a qubit only relying on its nearest neighbours”. His team performed detailed calculations, providing the quantum mechanical explanation for the counterintuitive discovery. 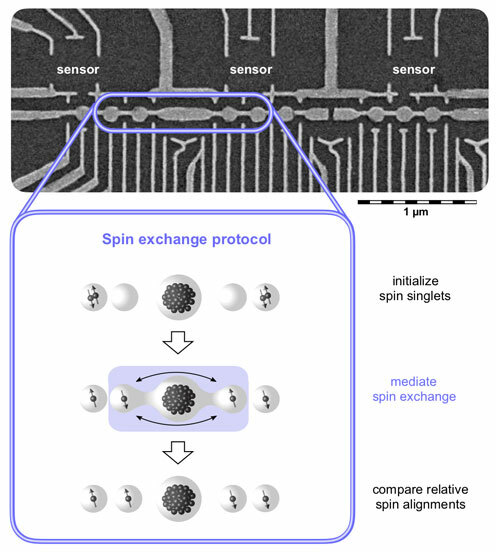 Overall, the demonstration of fast spin exchange constitutes not only a remarkable scientific and technical achievement, but may have profound implications for the architecture of solid-state quantum computers. The reason is the distance: “If spins between non-neighboring qubits can be controllably exchanged, this will allow the realization of networks in which the increased qubit-qubit connectivity translates into a significantly increased computational quantum volume”, predicts Kuemmeth. 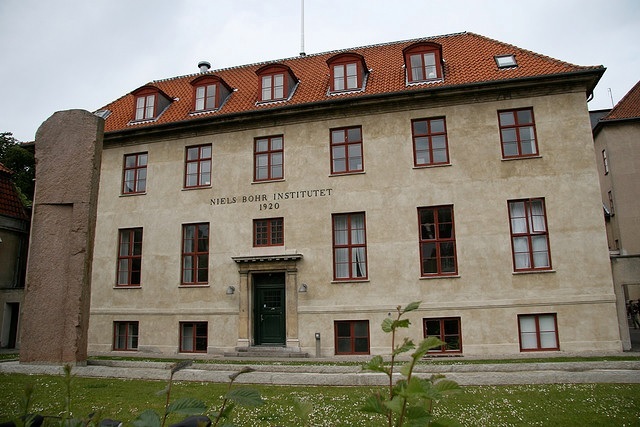 Niels Bohr Institute (Danish: Niels Bohr Institutet) is a research institute of the University of Copenhagen. The research of the institute spans astronomy, geophysics, nanotechnology, particle physics, quantum mechanics and biophysics. The Institute was founded in 1921, as the Institute for Theoretical Physics of the University of Copenhagen, by the Danish theoretical physicist Niels Bohr, who had been on the staff of the University of Copenhagen since 1914, and who had been lobbying for its creation since his appointment as professor in 1916. On the 80th anniversary of Niels Bohr’s birth – October 7, 1965 – the Institute officially became The Niels Bohr Institute. Much of its original funding came from the charitable foundation of the Carlsberg brewery, and later from the Rockefeller Foundation. During the 1920s, and 1930s, the Institute was the center of the developing disciplines of atomic physics and quantum physics. Physicists from across Europe (and sometimes further abroad) often visited the Institute to confer with Bohr on new theories and discoveries. The Copenhagen interpretation of quantum mechanics is named after work done at the Institute during this time. On January 1, 1993 the institute was fused with the Astronomic Observatory, the Ørsted Laboratory and the Geophysical Institute. The new resulting institute retained the name Niels Bohr Institute. The University of Copenhagen (UCPH) (Danish: Københavns Universitet) is the oldest university and research institution in Denmark. Founded in 1479 as a studium generale, it is the second oldest institution for higher education in Scandinavia after Uppsala University (1477). The university has 23,473 undergraduate students, 17,398 postgraduate students, 2,968 doctoral students and over 9,000 employees. The university has four campuses located in and around Copenhagen, with the headquarters located in central Copenhagen. Most courses are taught in Danish; however, many courses are also offered in English and a few in German. The university has several thousands of foreign students, about half of whom come from Nordic countries.